Defending World Champion Everton Lopez looked excellent tonight in an important match at Light Welterweight, proving that he is a force to be reckoned with again this year at the AIBA World Boxing Championships Almaty 2013. In an evening that featured some of the world's top boxers at Light Welterweights (64kg) and Heavyweights (91kg), high drama was inevitable. Light Welterweights Artem Harutyunyan and Everton Lopez provided a great match for boxing fans this evening. It looked good on paper before the bout had even started with the aggressive young German boxer taking on the defending World Champion and number one seed from Brazil. Moreover there was a splendid contrast of styles anticipated; Everton Lopez is a fantastic all round boxer whilst the German loves to roam forward and out-gun his opponents. The bout lived up to the hype. In the first round, the Brazilian southpaw looked very smooth but Artem was able to catch him on a few occasions later on. By the second it seemed as though the tide had turned however with the Brazilian now firmly controlling the direction the fight was tacking. By the third round, Lopez was standing his ground and bringing the fight to the German. Whilst it is easy to speculate from the armchair, you couldn't help wonder if the German almost showed his opponent a little too much respect early on and may have been better off trying to turn the bout into a scrap. Nonetheless, he himself was still happy with his performance. "I actually felt quite good out there from the beginning till the end. I've trained with him before and done some sparring and I felt good during those sessions too. So I had the motivation to go out there and do it. Also I think it was quite close, his coach said he thought that I had won it so that must mean something", said the smiling Harutyunyan. Evaldas Petrauskas of Lithuania was his usual monster-like self against Dmitrijs Galagot of Moldova at Light Welterweight. The Lithuanian came forward under the cover of his high guard, absorbing shots until he was able to offload the cannonball that is his right hand. The Moldovan wasn't shy about engaging with his opponent either and put up serious resistance. By the third round, the APB boxer was all over Galagot yet the latter still managed to offer some resistance forcing the bout to a 2:1 split decision in favour of the APB boxer. Can you imagine that a little less than a year ago, Petrauskas would have fallen into our Road to Dream Boxers' section? 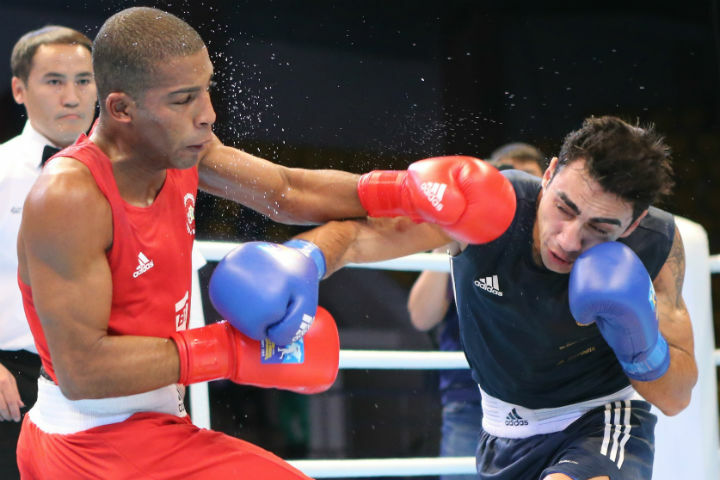 Erislandy Savon of the Cuba Domadores took on Algeria Desert Hawks' Chouaib Bouloudinats in a technical bout. Savon looks like a purpose built boxing machine when he is in the ring, but as you would expect for a boxer with the talent and experience of Bouloudinats, the Algerian was not at all over awed. That is of course until a huge left hook dropped him for an eight count at 1:48 of the 2nd round. Somehow the Algerian recovered to survive the round. To give full credit to the Desert Hawk, he did not shy away from the task that was now in front of him when he came out for the third. It may have been an uphill struggle, (make that, an uphill struggle that was cross country and in the driving rain), but he still came out and went for it. Un-phased by the portrait of athleticism that stood in front of him, Bouloudinats made a real go of it, but Savon was just, too strong, too fast and basically too good. The Cuban is obviously a serious contender here to go all the way. In a hotly contested bout between regional neighbours, Rustam Tulaganov from Uzbekistan faced the number six seed Anton Pinchuk of Kazakhstan at Heavyweight. The Uzbek had to fight not only his Kazakh opponent, but also the crowd, who of course provided something akin to an extra energy battery for the local athlete with their loud support. Somehow concentrating through the noise, Tulaganov remained focused on the task at hand and didn't let his emotions take over his boxing. The pace of the bout was nonetheless frenetic, yet in a serious statement of intent, the Uzbek took the bout in a split decision to advance to the quarter-finals at the Kazakh's expense. Marey Akshalov on the other hand was a Kazakh boxer who got the result he wanted today in his win over Carlos Adames of the Dominica Republic. In the opening round, the Dominican seemed very much in with a shot of winning as he clearly possesses bags of talent, but he was slightly out worked by the Kazakh in round one. In the second, things began to go downhill for him. Although Adames showed some great evasive skills, owing to the work rate and sheer confidence of the home boxer, the Dominican wasn't able to offer much offensively and began to struggle. The crowd of course is always a psychological factor and they began to bang their drums and chant in support of their local boxer who moved wonderfully in the ring. By the third, Akshalov was offloading shots at will and he took a well-deserved win 3:0. He certainly can't be written off as a serious medal contender. The Flyweights (52kg), Lightweights (60kg), Welterweights (69kg), Light Heavyweights (81kg) and Super Heavyweights (91+kg) are all taking to the ring tomorrow for an exciting day of boxing.